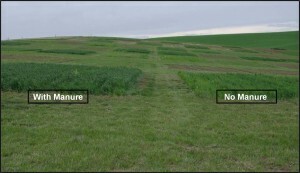 Maintaining soil quality and health in organic cropping systems is paramount. In fact, federal regulations state that organic growers must maintain and improve the physical, chemical, and biological conditions of soil, while minimizing the risk of erosion and avoiding contamination of soil, crops, and water (USDA-NOP, 2013). Organic growers have the option of using cover crops and rotations, as well as plant and animal residues to manage soil fertility. Sustainable soil management can also help reduce air and water pollution by improving the soil ecology and nutrient cycling. 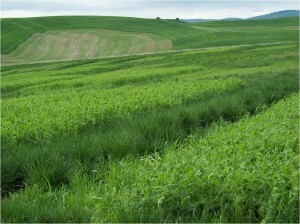 A well-developed stand of Austrian winter pea green manure in Pullman, WA. ‘Madsen’ soft white winter wheat with and without poultry manure added as a source of crop available nitrogen.